Aprende sobre la historia del parque nacional con un guía. Obtenga una perspectiva diferente del increíble paisaje de Banff, durante este recorrido de 1 hora a caballo por el río Bow o el río Spray. Esta experiencia de conducción ofrece a los visitantes una muestra de primera mano del paisaje salvaje de los alrededores de Banff, tal como lo habrían visto los primeros colonos, mientras montaban a caballo. Si elige cubrir el área de Bow River, diríjase a las aguas termales azufradas naturales. Siga el sendero, que gira alrededor de un pantano cerca del río Bow. Mientras conduce, vea las vistas del monte. Norquay y la montaña Cascade en la distancia. Si elige cubrir el área de Spray River, pasará Bow Falls, el famoso campo de golf Fairmont Banff Springs, y cruzará el tranquilo río Spray a medida que comprenda mejor la naturaleza virgen. Great for beginners of all ages. Staff very helpful and friendly.Very conscientious making sure all cents are safe. Gave me a chance to reacquaint myself with horseback riding. Last time I rode was almost 30 years ago! The staff were great, the views spectacular. 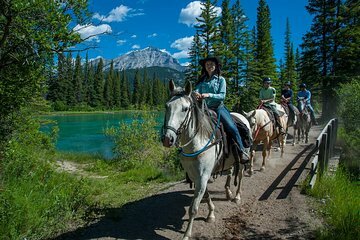 The only word of caution is that if you've had any horseback riding experience you will find this ride boring as there is no galloping or cantering allowed,slow walk for 2 hours. Ladies don't do your hair as it's mandatory you wear a helmet that's supplied by the barn, not the cleanest. The tour is great and the lady guide is very thoughtful and responsible. What I'm going to complain is the rate that I got from VIATOR is the exactly same that we can get from their online official website. This is the first time that I get no savings via Viator!! Excellent adventure. Very safe. Good views of the area. Our guide, Randy, was terrific and gave us insight not only on what we were seeing on the ride, but also good advice on where to go in the park. The staff was very friendly, helpful and provided helmets for all riders. The check-in was a bit chaotic - no verification of payment or ID was required. Although the online registration requested riding level it made no difference, most riders were inexperienced and we were all treated the same. The ride was very slow and the mosquitoes were terrible. Der Ausritt war einfach super, Wir waren mit der kompletten Familie unterwegs und haben sogar einen Schwarzbär gesehen. Absol brilliant. Thoroughly enjoy. Made a perfect addition to our dream honeymoon. Very happy with the service and ride. Would recommend.